This time last year, trainer Stephen Gray’s party finished well into the night as more than a bottle of gin was downed to toast to Bahana’s fine victory in the Group 1 Dester Singapore Gold Cup (2200m). Going on their current forms, which are clearly not a patch on their 2016 Singapore Gold Cup heroics, not many think Gray can make it back-to-back with either, but win, draw or lose, the gin and other libations will still flow in the fun-loving stable. 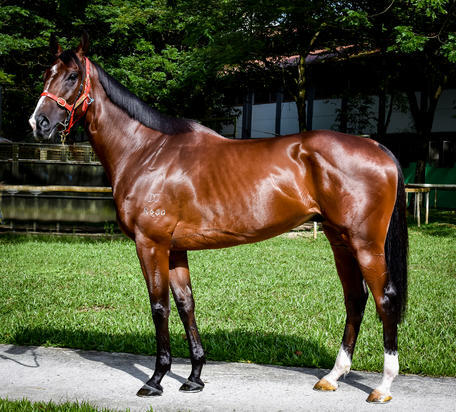 Bahana is out to restore the gloss that saw him claim the Dester Singapore Gold Cup last year. “The two horses are in good order. I expect both of them to run well,” said Gray. Gray has engaged William Pike on Bahana and Karis Teetan on Newlands. Despite their fantastic results in the 2016 renewal, it is highly unlikely the pair will feature among the top picks – just like last year - at their second shot at the Holy Grail of the Singapore racing calendar. Bahana, the Elusive City six-year-old who gave Gray and his Indonesian owner Untung Joesoef a memorable first win in the time-honoured race, has not visited the winner’s enclosure again, granted in only five starts. With stats that read 4-11-9-11-10, a repeat feat looks more like a pipedream at this stage. Newlands ran a cracking fourth under visiting New Zealand jockey Danielle Johnson last year at long odds of $224, but those may be even longer if the Mugharreb six-year-old’s last three runs are anything to go by: 9-7-11. Gray for one could not care much about the figures they show on the tote board. “Bahana had a chip removed and was a bit rusty at his last couple of runs. He is peaking at the right time,” he said. “He had a grass gallop today and he went very well. Vlad Duric rode him and said he quickened up very well and he was as fit as a buck rat. “Newlands also worked a treat. Andy (Ismail) rode him on the Polytrack. In Teetan, Gray wanted to renew ties with a jockey with whom he struck it lucky when they combined to take the Group 2 EW Barker Trophy (1400m) last November. The lightweight Mauritian jockey is currently in sizzling form in Hong Kong where he sits third on the ladder on 19 winners, surprisingly only nine winners behind Joao Moreira, usually the perennial tearaway leader in the former British colony every season.